So here we are at polling day in the ACT election. 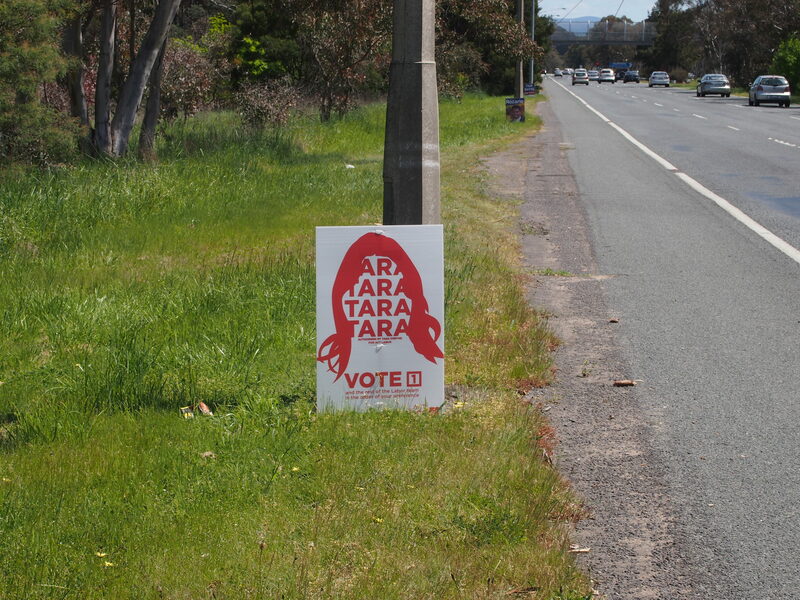 Undoubtedly one of the most noticeable features of this campaign over others is the plethora of signs that cover Canberra from north to south, east to west. In some areas the coverage is incredibly intense, numbering in the tens, where in others it may be the odd sign or two. Oh, and yes, some call these corflutes, but for the purpose of being crystal clear let’s just call them what they are – roadside sign advertisements. The ACT Hare-Clark Robson Rotation system by it’s design means that for a candidate to get elected a candidate can’t just rely upon preference flows, donkey votes or even stooge party preferences, they actually need to be a candidate that polls well in their own right. In other words their personal brand needs to have a resonance strong enough with the market that they can poll enough votes to get across the line nearly in their own right, regardless of what party they stand for. This means that candidates need to raise their profile and develop a strong connection and relationship with the market to become a MLA. The benefit of incumbency means that for some, such as the party leaders, their profile is high enough and strong enough to get them elected without the need to rely heavily upon signs. But for everyone else unless signs can help with this task. If the campaign team is professional enough, or switched on enough, they’ll of course use other tactics to get the job done and in an election such as the ACT’s that means door knocking, shopping centre meet and greets and of course turning up to as many community events as possible. All excellent investments of time, low expense, and of course great for meeting the engagement criteria. According to the only to date academic study done on roadside signs in politics yes they do indeed work in relation to generating awareness of a campaign. 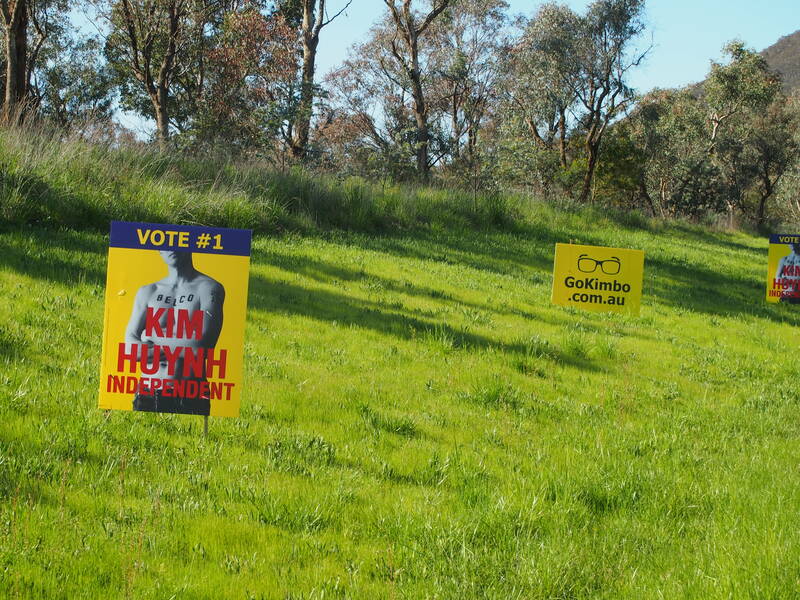 The evidence for this in the ACT election is the nifty work done by Tara Cheyne, Giulia Jones and Kim Huynh. Kim Huynh was the clear winner for best use of a sign. But only election night will tell if this converted into votes. Great location, great design that made them stand out from the standard portrait image, and of course a nice match to their actual personality all made these in my humble opinion effective at not just getting getting awareness but also gaining for some likeability, engagement and of course bumping them up in our brains ordering of candidates. And these signs have actually got each of these candidates some nice media and social media attention. Well done all. As for a great party sign, that yellow one as many of my friends called it has worked well for the Liberals. My only gripe with this is that it has been plastered perhaps too much, such as at Kambah Village, but the tactic of placing the negative sign next to the Labor candidate was an interesting one and something to note to see if it worked on polling day against those candidates where it was placed next to, especially on the southside. As for tactics we’ve seen some interesting approaches this election. There has been the positive/negative approach of usually the Labor candidate or party sign having a negative one staked right next to it. Then there has been the double positive approach, again favoured by the Liberals. The Libs loved using the double positive this election. There was no question at all that the tram was the most popular issue on many signs I noticed in my recon around town – nearly every single party referenced it in some way or other on a sign they used. It was strange to see though so many pro-tram signs by Labor in Tuggeranong and surrounds, especially considering the anger against the tram in those parts due to no mention of any date any time in the next decade when the Tuggeranong Valley may actually get a tramline. Someone in Tuggeranong really, really didn’t like these signs…or perhaps it was storm damage…you be the judge. And I have liked the joke signs placed near the Bunnings Belconnen and a couple of other spots around town. Always a nice break, even though they didn’t point to any particular candidate. Where the signs haven’t done that well is perhaps where they are just the standard portrait image. These blend in after some time and I was disappointed to see a lack of digital integration on them, such as a website address, social media, hashtag or even a QR code that was recently favoured by the far right AfD party in the local German elections. Time to get with 2016 people! The standard portrait image had a massive run this election…but it is time for a change. And signs that play to the core are great for the core, but they will vote for you anyway so perhaps change strategy here and actually target those you need to become elected. It has to be said here that there were far too many signs this election. Far too many. And here is my basic analysis from some select roads in Canberra to back it up. So if you drove along Drakeford Drive inbound last week you were exposed to literally hundreds of signs, 257 to be exact, in about 8 kilometres. My proposal here, and this is just brief, is to firstly allocate them to designated spaces. One local business in Tuggeranong seemed to have copped a right royal hammering from the presence of many signs and no, that was not fair at all. So be nice politicians, remember you actually need people to like you to get elected. It just isn’t good enough to say you are Team Good and therefore deserve to be elected over those Teams Bad. Next have these designated spaces costed for their placement and then have that cost deducted from the campaign finance. As an example, those Drakeford Drive/Parkway signs seen by roughly 17,000 cars a day according to Roads ACT figures, may go for, and I’m just guessing here so I may be wrong, about $150 per day. Multiply that out by 3 weeks, 7 days, and yes that is about $810,000. And that is one side of the road, one location only. I’m guessing we’d see a whole lot less signs if this happened. That should solve the issue of having too many of them but at the same time allowing a free fight for all those who want to run for office, big and small. And finally limit the negative signs. I’d do this by design, perhaps have 1-2 only and restricted by number, and that is it. Again, if you can’t promise that many positives to people I think you need to go back to the drawing board about politics. You need to give people a reason to vote for you, not just vote against the other candidates. 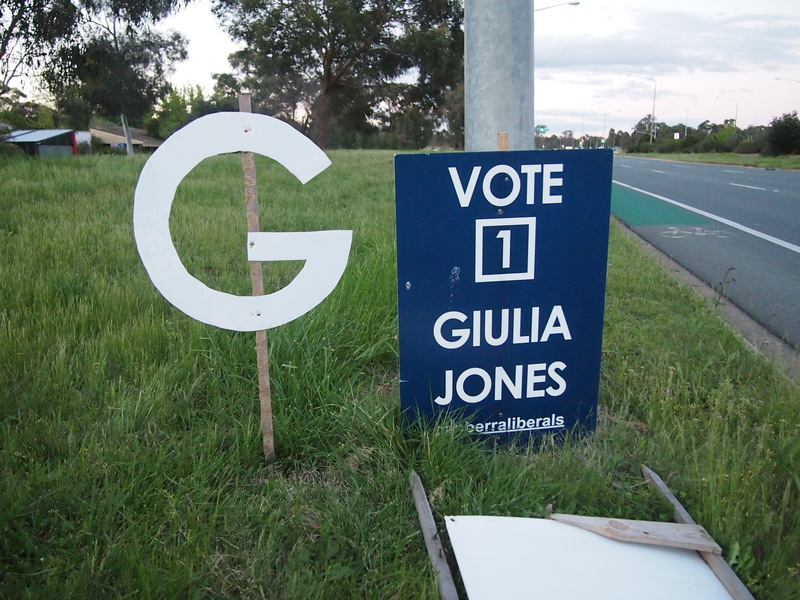 I hope you’ve enjoyed reading this piece, AND please understand this is just my thoughts and my guesses so I may be wrong on some of the pricing figures but I look forward to finishing my research project on the roadside signs of the 2016 ACT election at a date into the future.